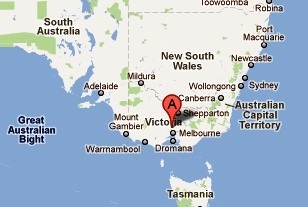 The area of the present day Australian state of Victoria was first settled by Europeans in 1803. It was officially part of New South Wales until 1851 when the British Government separated it from New South Wales and proclaimed the new Colony of Victoria. The area experienced a gold rush almost immediately as it produced 20 million ounces of gold between 1851 and 1860. Victoria became a state of Australia in 1901, when Victoria along with five former British colonies united to form the Commonwealth of Australia on January 1, 1901. Melbourne was the financial center of Australia and New Zealand at the time and it was the capital of Australia between 1901 and 1927. Melbourne was the largest city in Australia until the 1970s when it was overtaken by Sydney. Victoria is bordered by New South Wales to the North, South Australia to the West, and the Bass Strait to the South separating it from Tasmania. It has a total land area of around 92,000 square miles and a population of over 5.5M. The first stamps of Victoria were a set of four stamps issued in 1850 showing a portrait of Queen Victoria (QV). The set (Scott #1 to #4) catalogs for around $6.5K Mint and around $650 Used. There are some color varieties and a value omitted error (Scott #7b) which command higher premiums. The same design was used for a few other issues until 1851 and the first issues are all very valuable fetching well into the 100s. A new design a portrait of Queen Victoria Seated on Throne appeared in 1852. The stamp (Scott #14) catalogs for around $240 Mint and around $40 Used. The same design appeared in another set of two stamps (Scott #15 to #16) in 1850 and they also fetch into the 100s for Mint and around $30 for Used. Queen Victoria portraits in different designs formed the stamp issues of Victoria during the period till 1901. 205 different stamps were issued during the first fifty years – the lowest denominations of the later issues fetch a few dollars while the higher denominations start in the 10s. Victoria released a set of seven stamps in four different QV portrait designs between 1863 and 1867 and that set (Scott #74 to 80) is especially sought after, cataloging in the $1100 range for Mint and around $110 for Used. The first issue outside of the QV theme was a set of two stamps issued between 1901 and 1905 showing a head portrait of King Edward VII (KEVII) in two separate designs. The high value set (Scott #206 to #208) in one-pound and two-pound denominations catalogs in the $1100 range for Mint and around $550 for Used. There is a Perf variety (11) of the set that catalogs even higher. Victoria continued to issue stamps until 1912 when they were replaced by stamps of Australia. Several private token coins were used in Victoria from the mid-nineteenth century onwards. Prominent ones include Copper Pennies of Adamson, Watts, McKechnie & Companay of Melbourne, John Andrew & Company of Melbourne, Jno Andrew & Company of Melbourne, Annand, Smith & Company of Melbourne, Barraclough of Richmond, William Bateman Junior & Company of Warnambool, I. Booth of Melbourne, T. Butterworth and Company of Castlemaine, R. Calder of Castlemaine, Thomas H. Cope of South Yarra, Crombie, Clapperton & Findlay of Melbourne, Crothers & Company of Stawell, Jas. Davey & Company of Sale, A. Davidson of Melbourne, etc. Valuations in VF go well into the 100s and 1000s depending on rarity. Historic items connected with the gold rush are a good collectible item of Victoria.